One Simple Place to Find Ideas for New Content — Lauren Myers & Co. Thinking of new blog post topics can be challenging. You may feel like you have maxed out on topics especially if you have been in the blogging game for a while. Just know, there is no such thing as maxing out of blog post topics! You just have to get creative in your research efforts to find out what people want to learn more about. You can do this simply by performing a keyword search on your website platform’s analytics section or using the Google Search Console. Today I will be discussing the benefits of performing keyword searches and how to find them for your website. To start, a keyword search is when someone types into a web search engine box when they’re looking for information. When the search engine has crawled for websites related to the words that were entered into the search console, the results will appear in order by the most popular/relevant pages. So how can bloggers use this information? Easy...this is how you can determine what the most popular topics are in your niche that people are searching for and the EXACT words they used when searching. You can start using the exact phrases in your website contents so your site will appear higher in ranks in search results. You can find out what people are searching for and create a solution for them. This could be a blog post, product or service! You then will use the keywords in your post/product/service descriptions on your website to also increase the chances of your site ranking higher in search results. You can narrow down what you post about rather than having such a broad range of topics. If you notice you are getting a ton of searches for one topic, you may want to shift your content over in that direction. My website is built on Squarespace and there is a section in my account dashboard that shows keyword searches. The data is coming from the Google Search Console which is linked to my Google Analytics account. To view the information in Squarespace, from the Dashboard click “Analytics” then “Google Search Keywords”. Upon first arrival, you will be asked to link to your Google Analytics account so the console data will pull from the correct account. Make sure you link to the Google Analytics account that your URL is set up on. This is where all keywords and phrases appear along with their stats. You can adjust the search time frame by changing the drop down data criteria on the top right of the analytics screen. If you don’t have Squarespace, your website platform may still have a keyword search section in your website analytics dashboard. When my website was on the Big Cartel platform, there were keyword search results in my dashboard. Check your platform for this feature or do a Google search (how meta is that?! Do a Google keyword search about Google keywords, ha!) to find out where to navigate to find the data. If your website platform doesn’t have keyword data built in, you can always view the data directly on the Google Search Console. Make sure you have Google Analytics set up for your website already because you will be linking the search console to it! 2. You will be asked to sign into your Google account. Make sure you are signing into the account that your Analytics account is linked to. 3. Enter the full URL that is linked to your Google Analytics account. 4. You will be asked to verify that you own the URL. 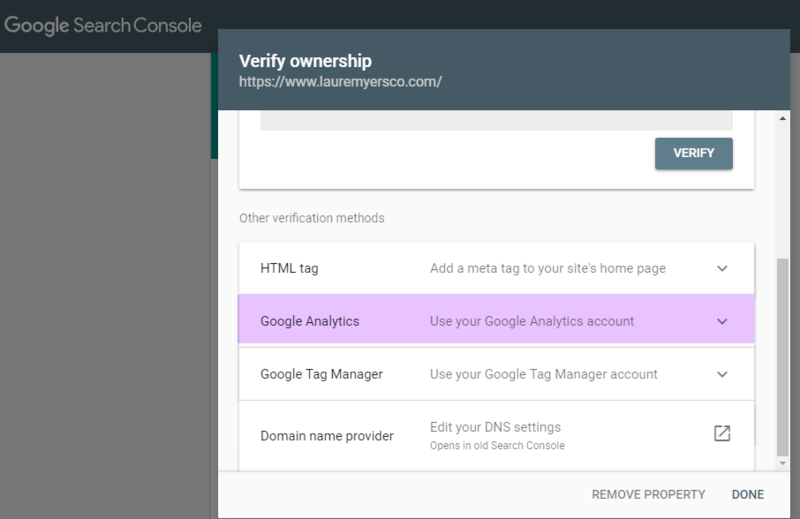 If the default verification method listed isn’t Google Analytics, scroll down to the section stating “Other Verification methods” then click “Google Analytics”. 5. Once verified, you can then view the dashboard. 2. The Performance page shows the search terms used by people who found your site through a Google search. 3. You can view detailed data for a specific search term by clicking the line item under the Query column. 4. You can adjust the date range to view search details for a specified time frame. 5. You can also compare stats for different date ranges. The keyword stats are such a helpful thing that will give you more insight on what’s happening before someone finds your site and help you drive more traffic (hopefully coins!) as a result. Take advantage of this if you are getting stumped on a product, service or blog post to create! Do you review and use the search terms that are bringing users to your website? If so, tell me how you use the information in the comments!